Fungal acne, or pityrosporum folliculitis, is an inflammation of the skin that occurs within the hair follicules. While it may look like regular acne, “fungal acne” is not actually acne at all, since it’s caused by yeast and not bacteria. Fungal acne is usually resistant to traditional acne treatments, but can be successfully reduced with the right body washes and oral medication. Despite the name, fungal acne isn’t actually acne at all. The proper terms for the medical condition known as “fungal acne” are pityrosporum folliculitis or malassezia folliculitis. “Pityrosporum is a yeast organism that is found as part of the normal skin flora, but in some individuals it overgrows and produces eruptions,” explains Dr. Robin Evans, a board-certified dermatologist at Southern Connecticut Dermatology and a clinical instructor at the Albert Einstein College of Medicine, in New York City. Yeast tends to grow in environments that are hot and humid, or on places of the human body that are sweaty, which is why yeast infections like pityrosporum folliculitis can arise in the summertime as temperatures increase. If you move from a dry, cooler climate to one that’s warmer and more humid, you might also find yourself developing fungal acne. Wearing non-breathable clothing that traps sweat, or not changing into dry garments after a workout, can contribute to the growth of yeast on your skin. This is why fungal acne tends to appear in areas that usually remain clothed, such as the back, chest, and shoulders, though it can occasionally be found on other areas, including the face. Regular acne (acne vulgaris) results when a hair follicle gets blocked by sebum and causes oil build-up. If that build-up gets infected with bacteria, the skin can swell and a pimple will form as the blockage begins to break down. On the surface, fungal acne looks very similar to regular acne: small red bumps and/or whiteheads filled with pus, always centered around a hair follicle. Because of these similarities, fungal acne is often misdiagnosed as regular acne. However, fungal acne is generally uniform in appearance, presenting as bumps approximately one millimeter in size, whereas regular acne comes in a variety of forms, including whiteheads, blackheads, pimples, cysts, and nodules. Regular acne isn’t contagious, but fungal acne is because that yeast can be transferred from person to person. While it’s by no means a foolproof identifier, the placement of a breakout can help indicate whether its caused by yeast or bacteria. Acne vulgaris is usually present on the face, whereas pityrosporum folliculitis can be found on the back, shoulders, and chest. If the bumps are of different sizes, or if they’re much larger than one millimeter, then the breakout is probably not fungal acne, but rather regular acne. Fungal acne may also feel different from regular acne. Patients often report itching and/or burning sensations, which are caused by inflammation within the hair follicle, whereas acne vulgaris usually does not itch or burn. “The rash is classically very itchy, which is not typical for garden variety acne, but the individual lesions do resemble typical pimples or pustules of acne. However, blackheads and whiteheads would not typically be part of a fungal acne eruption,” explains Dr. Evans. If the breakouts have been resistant to regular acne medications, whether topical or oral, that’s a likely sign that you’re dealing with pityrosporum folliculitis. Because regular acne medications are designed to treat bacteria and not yeast, those medications won’t affect fungal acne. Since individuals can have both fungal acne and regular acne at the same time, a combination of medications may be needed to target both bacteria and yeast. As with regular acne, there are two ways to address fungal acne: topical treatments and oral medications. If your fungal acne isn’t too severe, your dermatologist will likely start you out with a simple sulfur body wash that’s antifungal and antimicrobial. Some dermatologists even recommend using dandruff shampoo, such as Selsun Blue or Nizoral, as a body wash. (While dandruff can have many causes, one of them is the malassezia yeast that can cause fungal acne.) Apply the shampoo to your dry skin, leave it on for about 10 minutes, and then wash it off in the shower. If after a few weeks pityrosporum folliculitis hasn’t responded to the body wash, your dermatologist will likely prescribe an oral antifungal medication. These are usually effective in clearing up fungal acne, though recurrences can and do happen. There are a few easy steps you can take to reduce the chances that you’ll develop fungal acne. First of all, wear breathable clothing made of cotton or other materials that don’t trap sweat, especially if you know you’ll be in a hot, humid environment. Whenever you’re done sweating, immediately take off your damp clothes and change into dry ones. If you feel like you still have sweat and oil on your skin, do a quick wipe down to get rid of anything that might clog your pores and get down into hair follicles. You might also want to incorporate a salicylic acid cleanser into your washing routine or keep towelettes with exfoliating ingredients on hand. Because excess oil and dirt promote the growth of excess yeast, keeping them in check can help cut down on fungal acne. Dr. Evans also recommends taking probiotics during and after treatment as a preventative measure to help decrease yeast overgrowth and prevent recurrences. Acne can be physically scarring and emotionally troubling, even more so if the acne resists treatment. But if your breakouts haven’t responded to bacteria-targeted medication, you might be contending with fungal acne instead, which can be easily treated with the right products. Dealing with fungal acne isn’t like dealing with other forms of acne. Because it’s caused by yeast, it can only be treated with a cleanser that’s anti-fungal and antimicrobial. Here are some of the best body wash options. 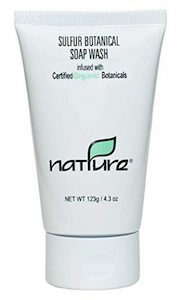 Designed for use on the face, back, chest, and shoulders, Nature Pure Sulfur Botanical Soap Wash’s pH-balanced formula helps control bacterial and yeast acne. This cleanser is formulated to be strong enough to fight serious acne, but it’s also infused with aloe and camomile to help soothe skin and prevent irritation. 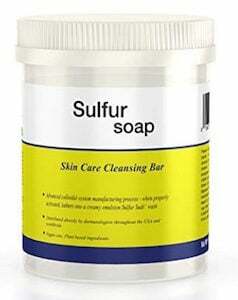 This sulfur bar soap contains 10% sulfur, making it ideal for targeting fungal acne. After soaking in warm water for twenty seconds, the bar will become activated and form a foamy lather when scrubbing. As it does contain significant amounts of sulfur, the bar produces a sulfur-like odor. If you would rather use an odorless body wash, SAL3’s soap bar might be for you — it’s entirely fragrance and perfume free. It contains 10% sulfur and 3% salicylic acid, allowing it to combat both fungal and regular acne. 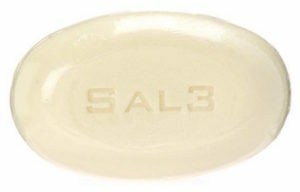 SAL3 soap also comes with a special jar for storage so that it remains activated. 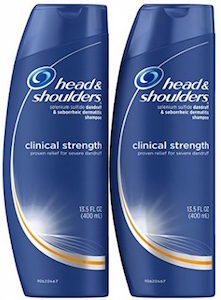 If your fungal acne is more severe, your dermatologist may recommend using a dandruff shampoo as a body wash. Head and Shoulders, the brand most recommended by dermatologists, nourishes the scalp and destroys fungus with its 1% selenium sulfide formula. 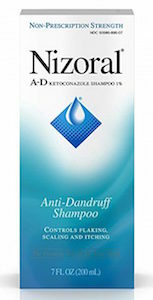 Nizoral Dandruff shampoo is made with ketoconazole 1% and targets the fungus that causes dandruff and fungal acne. It works even in-between uses because it binds to the proteins of your body, allowing you to use it in conjunction with your regular body wash.